Australia World Cup squad locks, 50-50s, and those in the firing line. 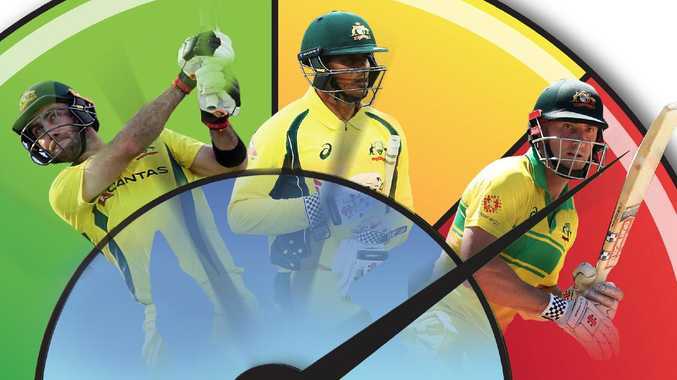 NATIONAL selectors are running out of time to solve the seemingly impossible puzzle of Australia's 15-man Cricket World Cup squad. No less than 22 players are arguably worthy of selection - but it doesn't take a mathematician to work out that seven of those will be left bitterly disappointed. Here, we've tried to make sense of the dilemma facing selectors by looking at who's a lock, a 50-50 chance, or in the firing line. Had the veteran saved his 2018 form for 2019 then this topic wouldn't be up for discussion - Marsh would be a lock. The 35-year-old scored three centuries and averaged 59.42 last year but only made two half-centuries in eight matches against India and Pakistan. Steve Smith is now looking for a spot in the top-mid order and it could be Marsh's he takes. Weighing in Marsh' favour is the two half-centuries he scored against Pakistan and the two centuries he scored in England last year. 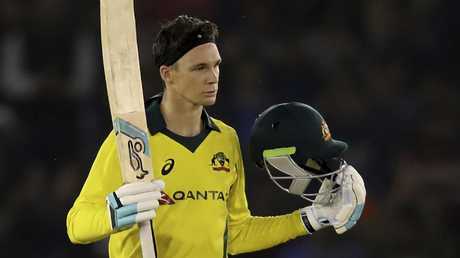 Peter Handscomb was among the stars for Australia in India. 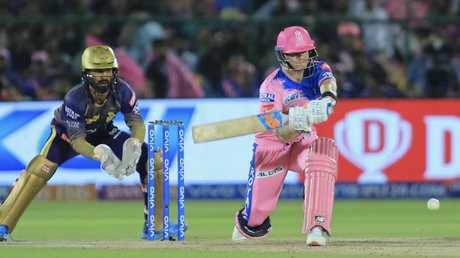 Handscomb fired into World Cup contention in India where he averaged 47.20, but failed to back it up in the UAE where he failed to score a half-century. The 27-year-old is under the same added pressure as Marsh given his spot is also one Smith could settle back into. The fact he could serve as a back-up gloveman helps his chances, though. Like Handscomb and Marsh, Behrendorff will be looking over his shoulder given the calibre of sidelined talent that should be available for World Cup selection. If fit, quicks Josh Hazlewood and Mitchell Starc would likely pip Behrendorff for a spot after modest performances against India (no wickets) and Pakistan (four at 23). Taking the most wickets in the Big Bash League earned Richardson an ODI call-up in India before he was sent home with a sidestrain without making an appearance. Two wickets at 49.00 against Pakistan has him also unlikely to keep his spot over a fit Hazlewood or Starc. Turner's stunning 84 not out off 43 balls against India last month not only turned heads, but also saved Australia from the jaws of series defeat. Nonetheless, he didn't play a match against Pakistan as selectors voted for continuity, rather than experimentation before the World Cup. Those non-selections have all but sealed his fate. Difficult to fathom that a man who has made two centuries, five fifties and averaged 65.50 in his past 10 games isn't a lock for the World Cup. 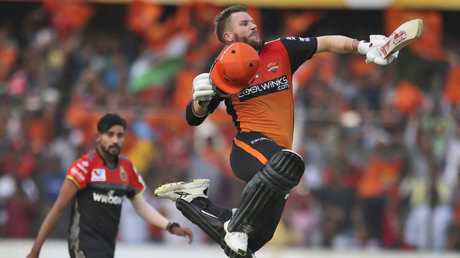 But his competition is Aaron Finch - Australia's captain who averaged 112.75 against Pakistan - and David Warner who averaged 87.25 in his first six Indian Premier League matches. A shift down to No.3 could be an option, although he only averages 24.33 there in ODI cricket. Given he is 2019's highest run-scorer in ODI cricket, he would have every right to feel stiffed if he is left out. Steve Smith is more of a ninety-ten - but not a lock regardless. More of a ninety-ten - but not a lock regardless. Firmly on the path to being one of cricket's greatest ever batsmen before his suspension, it seems highly unlikely he won't be at least in Australia's best 15 on his return. Although, Australia's winning streak of eight games without him has at least opened the door to the possibility of him missing out. Should Stoinis earn selection, then he will bring into the World Cup a concerning run of form that saw him only make 16 runs and take two wickets against Pakistan. Nonetheless, Australia loves to pick a fast-bowling all-rounder and he has little competition on that front. He was also one of Australia's best performers over the summer. Selectors would have to buck the trend and go to an extra spinning option - maybe D'Arcy Short - for him to miss out. The formula for Lyon seems simple; he's in if selectors want two spinners, or out if they don't. Adam Zampa will be the first spinner on the teamsheet after stepping up with 18 wickets in his past 10 matches. But Lyon's pressure building in the middle-overs and economical bowling is thought to be a key factor to Zampa's - and Australia's - success. 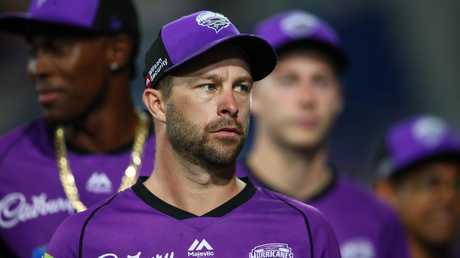 The 31-year-old is accustomed to bouncing in and out of the ODI squad, and so it's no surprise he's probably only a 50-50 to go to the World Cup. Relatively reliable with the ball - albeit a touch expensive - and can swing a bat, although his numbers don't demand selection. 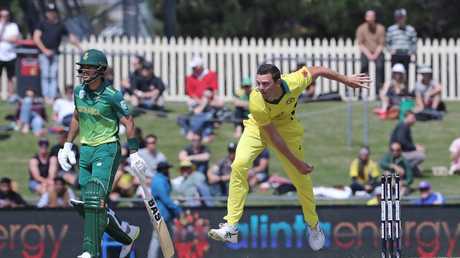 The exciting 22-year-old looked set for a World Cup spot after a breakout summer that saw him emerge as a genuine threat to the place of Josh Hazlewood, and to a lesser extent, Mitchell Starc. He was expected to be named as at least a pace back-up before he dislocated his shoulder in the second ODI against Pakistan. Now he's in a race against time and selectors will need to decide if they want to pick yet another quick under an injury cloud. It's worth noting Australia can still change its squad up until a week before the tournament commences, so selectors might just gamble on the rookie. Josh Hazlewood is in a race against time after missing both ODI series on the subcontinent. Hazlewood is also in a race against time after missing both ODI series on the subcontinent due to a stress fracture in his back. But even if he is fit, a quiet 2018 and a summer below his lofty standards has seen Fox Cricket experts Allan Border and Mark Waugh deem him surplus to requirements for Australia at the World Cup. Experience is on his side though, while others would argue form is temporary and class is permanent. Twelve months away from the game seem to have done David Warner no harm. Twelve months away from the game have clearly done Warner no harm after he blasted 349 runs at 87.25 in his first six IPL games. He's topscoring in the star-studded competition, ending any discussion about whether or not he would be the same after his ball-tampering suspension. If anything, he's somehow stronger. Selectors were faced with the very real possibility of needing to drop their captain for ODI cricket's biggest event after Finch made just 83 runs at 11.86 across seven matches. He made two centuries, three fifties and averaged 76, in his following nine. He didn't just put the issue to bed - he killed it for good. Maxwell has proven time and time again over the past two series why he's nicknamed 'The Big Show', repeatedly delivering for his nation in a variety of roles. Whether he's asked to score in a hurry, or just find the gaps, Maxwell can deliver in a way few others can. His best work last month was against Pakistan (258 runs at 64.50), although his 115 at 23.00 against India was still of high value. He was hit for less than a run a ball in both series, too. Is there a better fast bowler in the world right now? Possibly, but there certainly isn't in Australia. He took 14 wickets at 15.71 against India before 3-23 in one match against Pakistan. Carey put the whispers about Handscomb taking his gloves to bed in March with consistently good performances with the bat and behind the stumps. He averaged 34.33 against India and 40 against Pakistan while scoring at almost a run-a-ball; more than suitable numbers for a No.7-No.8. All the major World Cup contenders will need a wicket-taking leg-spinner and Zampa is Australia's. He snared 11 at 25.81 against India and another seven at 37.28 against Pakistan while being hit for less than 5.70 an over. He was also the only player in the entire Pakistan series to snare more than three wickets in a match (4-43). Mitchell Starc found some of his best form once again towards the end of the summer. The 2015 World Cup player of the tournament has the x-factor Australia will need in its attack to once again go all the way. He found some of his best form once again towards the end of the summer and, most importantly, his speed. If fully recovered from a pec injury then there's no chance he's being left behind. Short continues to catch the attention of big names who are calling his selection. Ian Healy is one of them, and the other is Shane Warne who would have the big-hitting left-hander at the top of the order. Short finished the BBL as the highest run-scorer for the second season in a row (637 runs at 53.08). Matthew Wade is in a seriously rich vein of form and can wear the gloves or play as a specialist batsman. Wade was similarly impressive in the BBL, scoring 592 at 42.28 to go along with an outstanding Sheffield Shield season (1021 at 60.05). He's in a seriously rich vein of form and can wear the gloves or play as a specialist batsman. The main competition for Stoinis' all-rounder spot who was part of Australia's World Cup winning squad in 2015. He hasn't played an ODI for Australia since January 2018 though and has performed modestly on the domestic scene.